Update news please click here! Broadway - City Hall Canada line station. We would welcome the opportunity to provide you with a free consultation to discuss your specific situation as well as possible treatments that might be appropriate for you. Call (604) 731-3319 today to schedule your appointment. 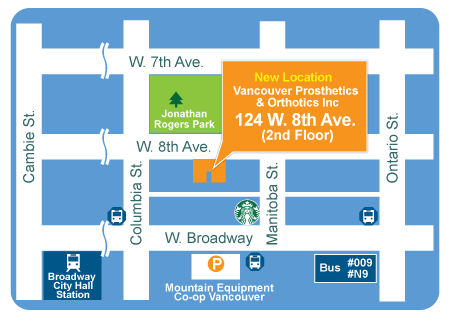 *Please note, our main office is located on the second floor with access by stairs only. If you are unable to walk up the stairs, our office has treatment rooms available on the ground floor. Please advise our reception when making your appointment. Thank you very much for your cooperation. Cancellations after business hours voice mail or by email is not accepted.